NBC Universo NOW is a free service offered through participating US TV providers, which allows subscribers to live stream programming from NBC Universo, as well as watch programming on-demand for the upcoming 24 hours after the live programming had been aired. NBC Universo subscribers can access NBC Universo NOW from desktop and laptop computer anywhere within the U.S. Users who do not subscribe to NBC Universo on their cable package can still access clips, highlights, and a limited number full show episodes. NBC Universo is a Spanish language television channel targeting US hispanic audiences in the USA. It is available on most U.S. cable systems, as well as on major satellite and IPTV platforms. Formerly known as mun2, it is part of the NBC family of networks and owned by the NBCUniversal Hispanic Group. Subscribers to NBC Universo are able to use NBC Universo NOW via their computers or mobile devices anywhere in the U.S. This service will also give non-subscribers the opportunity to watch highlights, clips from various shows and some episodes from some of the channel's properties online. Soccer-related coverage of this service may include some Premier League games, added to World Cup Qualifying mathes. Universo NOW owns broadcasting rights to stream all FIFA tournaments, including the FIFA World Cup, from 2015 to 2026. This service is available on the NBC Universo NOW website as well on the Android or iOS apps. Content will be available both live and on-demand. Programming is available online on its website and related apps to subscribers of participating TV providers, including Comcast XFINITY, DirecTV, DISH, Spectrum, Verizon, AT&T U-verse, Cox, Optimum, Bright House Networks, Suddenlink, Mediacom, Cable ONE and RCN. 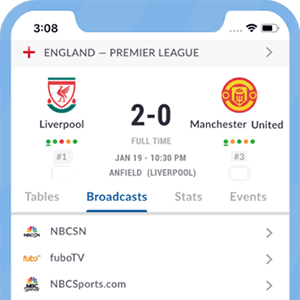 Soccer matches telecast by NBC Universo are usually also available on web and mobile platform Telemundo Deportes En Vivo. *Got itLive Soccer TV does not provide UNIVERSO NOW live streaming. The information provided on this page is simply UNIVERSO NOW soccer TV schedule.